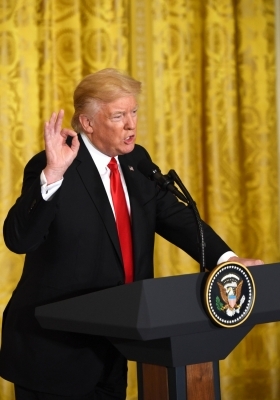 US President Donald Trump told young undocumented migrants protected from deportation under the DACA program that they need not worry about their immigration status for the next six months, the period the president gave Congress to find an alternative to the immigration plan. “For all of those (DACA) that are concerned about your status during the 6 month period, you have nothing to worry about – No action!” said Trump on Twitter on Thursday. Trump’s tweet came shortly after a telephone conversation he held with Democratic House Minority Leader Nancy Pelosi in which she expressly asked him to promise the DACA beneficiaries that they will not be deported during the six-month period prior to March 5, 2018. A Democratic aide present at a closed-door meeting in which Pelosi told several lawmakers from her party about the details of her conversation with Trump and her request that he reassure DREAMers, requesting anonymity, revealed the contents of that discussion. According to White House press secretary Sarah Sanders, Trump spoke Thursday with Pelosi but also with House Speaker Paul Ryan and Senate leaders — Republican Mitch McConnell and Democrat Chuck Schumer — in keeping with his commitment to work with “all parties”.